Recently This American Life did a two part series on school integration. These episodes were the first time I had heard anyone publicly address the issue of school integration in a long time. School integration, while tried and was successful in some places, has been largely abandoned as a school reform strategy. The first episode deals with a black school district outside of St. Louis, not far from Ferguson, that lost its state accreditation. Families in the district, called Normandy, were offered spots in a nearby white district. When white families heard about the Normandy students coming to their district, they protested. White families went into arguments about worrying about their school district losing accreditation and fears of violence when the new children came into their schools. One white woman even said, “this is not about race,” but clearly it was. What else could it be about? Similar arguments were used in Yonkers to keep blacks from moving in to white sections of town in the 1980’s depicted in David Simon’s Show Me A Hero where whites worried about declining property values. Today we are more segregated than ever, or what some people have called, hyper-segregated. Living separate lives have led to tremendous misunderstandings, resource inequity, and violence. It’s really time to deal with racial fears that prevent us from improving schools and urban life in general. So, when people ask me what will improve public schools? Or, how do we reform urban schools? 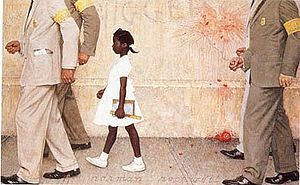 I say we will need to deal with racism in order to improve all of our public schools. That sounds overwhelming or perhaps even dismissive, but it is neither. It is a way of saying that we need to think systemically, and to not blame poor communities of color for failed schools. We need to start with ourselves and begin where #Blacklivesmatter activists demand that we do by admitting our role in racial inequity, reconcile, and move from there.